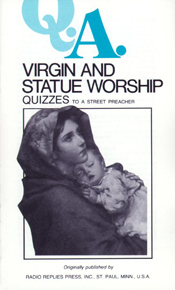 101 Questions and Answers on 2 topics very often misunderstood by non-Catholics. Shows that Catholics do not at all adore statues or Mary! (Statues are "3-D pictures.") Shows that the honor paid to Mary, though special even among the Saints, is not the adoration paid to God! etc., etc.